After a 15-month slowdown, here's one sign the global manufacturing PMI may begin to rebound soon. 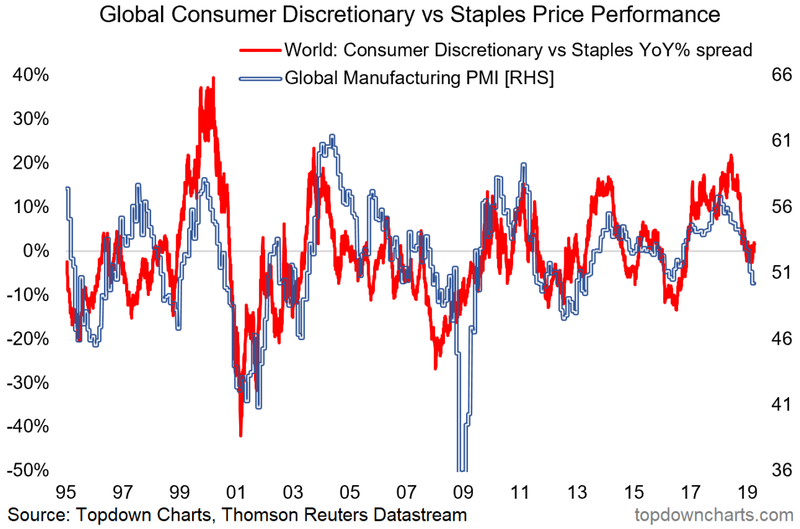 Historically the relative performance of global consumer discretionary vs staples stocks has moved closely in line with the global PMI. The rebound in discretionaries vs staples, though nascent, provides at least food for thought against the torrent of bearish sentiment. A couple of key macro developments also support this thesis. One key feature of the last 15 months has been the consistent declines in the global manufacturing PMI. After peaking in December 2017, the global manufacturing PMI has undergone a major slowdown, and that was a key driver behind the weakness in global markets last year (and a reflection of stimulus withdrawal). The chart shows the return differential between global consumer discretionaries and consumer staples against the global PMI. As you can see there has been a slight rebound in the performance differential. This chart is one of the increasing number of "green shoots" on the global growth outlook we're seeing. And while it's certainly true that we will need to see some follow-through in the red line to confirm this view, the fact that it's already begun diverging to the upside against the global PMI is indeed a promising sign. So what's behind this and the other so-called "green shoots"? There's a few things at play, first is simply the washing out of some of the major previous headwinds e.g. the trade war arguably has already unleashed its maximum damage on the global economy (that is, the impact is not getting incrementally worse). The other big thing is the policy pivot. In America the Fed has opted to taper QT and put rate hikes on ice, elsewhere around the globe we've seen a lurch to the dovish side, and the composite shadow policy rate for developed markets has fallen about 50bps since peaking in November last year. As to why this matters, my view has been that the key determinant of how risk assets perform this year is going to depend on whether the slowdown is the start of a global recession or simply a passing growth scare. Today's chart provides some evidence for the latter. If you like my free articles, you will probably like our Marketplace service which takes a deeper look at select ideas, provides you with a comprehensive weekly global market snapshot, and a monthly 'cheat-sheet' on the outlook across global markets. Click here to take a free look.